US $24 a per month for unlimited prims on up to a 2×2 varregion, with hypergrid and Vivox voice. $119 a month for a mini-grid of up to 16 regions, including Vivox voice, default avatars and currency. 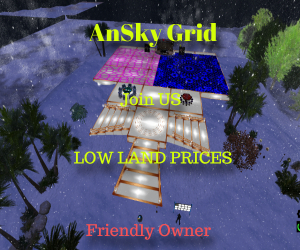 $15 a month for a 16,000-prim region on the hypergrid-enabled DigiWorldz grid, no setup fee. Private grid hosting also available. Taarna Welles: the next Linda Kellie? What are the best grids?